Late last week, the Major Cities Chiefs Association and the Major County Sheriffs of America sent a letter to President Trump's son-in-law Jared Kushner informing him they are unable to offer their support for the FIRST STEP Act, the criminal justice reform bill of which Kushner has been the chief architect. Specifically, the MCCA and MCSA told Kushner they could not support a new revision of the bill, expected next week, which will add features of the Sentencing Reform and Corrections Act (SRCA) to FIRST STEP's original language. The two groups join several others, including the Assistant U.S. Attorneys Association and the National Sheriffs Association, in opposing the bill. 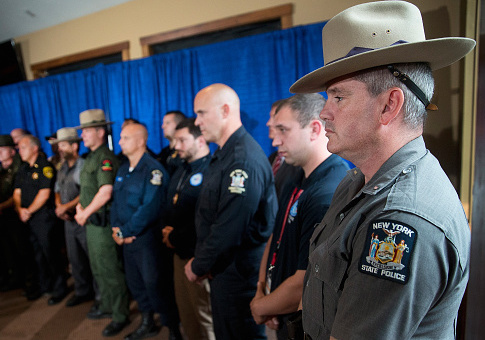 All of these law enforcement organizations share the same central concern: that FIRST STEP's main plank, an enhanced system of "good time" credits permitting earlier release for certain offenders, could indirectly lead to the release of dangerous drug dealers who would then exacerbate America's drug crisis. "Our Nation now struggles with an epidemic of opioid addiction, a crisis driven by repeat drug traffickers," the letter reads. "Loyal to our oath of office, we cannot endorse legislation that would accelerate the release of the repeat offenders who are responsible for trafficking narcotics in the communities we serve and have caused the largest illegal drug related loss of life in history." The letter asks Kushner's office to answer 13 questions, each addressing major concerns about how FIRST STEP’s sentencing reductions could indirectly lead to the release of dangerous criminals. This latest development represents yet another setback for Kushner, because both the MCCA and the MCSA supported sentencing reform when a proposal—the original version of the SRCA—was introduced in the congressional session prior to the current one. Then, the SRCA was a standalone bill that would have reduced federal mandatory minimums and otherwise cut federal sentences. The bill garnered bipartisan support but was never brought to a vote by Senate majority leader Mitch McConnell (R., Ky.), who likely feared it would divide his caucus. The FIRST STEP Act was conceptualized for the current Congress as a potential compromise able to command the support of a White House sympathetic to prison reform. But in late August, following strong opposition from the Department of Justice, Trump announced that he would not support the bill until at least after the midterms. He then cited the same concerns raised by the MCCA and MCSA, as well as the Justice Department and other law enforcement groups, about the potential release of drug traffickers. Text of the new version of FIRST STEP has not been released (a fact that the MCCA and MCSA cited as part of their concerns about it), but it is expected to address some of Trump's concerns as well as incorporate four sections of the SRCA pushed for by a group of pro-reform Republican senators. But the uniform lack of support from the law enforcement community potentially throws a massive wrench into Kushner and co.'s plan to get sentencing reform off the ground following the midterms. A staffer involved in the process told the Washington Free Beacon that reform advocates still hope to earn the endorsement of the National Organization of Black Law Enforcement Executives (NOBLE), but it is unclear if they will clinch even this endorsement. This entry was posted in Issues and tagged Drugs, Police, Prison, Prison Reform. Bookmark the permalink.